Nokia love to surprise people, and the Nokia 6600 is a great big, and rather nice, surprise. It's quite a wide, curvy phone, but the real beauty of the Nokia 6600 lies inside. In addition to the usual great stuff like MMS, Java, Bluetooth and a BIG 176x208 65,000 colour screen, it also features a digital zoom camera, video recorder and a RealOne player for a fantastic multimedia experience. The 6600 is certainly a stylish looking handset too. That's not all, the Nokia 6600 has an advanced XHTML browser, 6Mb memory, PC synchronisation, a Symbian OS, joystick controller and much more. The Nokia 6600 measures 108.6 x 58.2 x 23.7mm and weighs 125 grams. The Nokia 6600 is a bit wider and heavier than most phones but then its strength is in video and photo playback, so a nice big screen is a must. 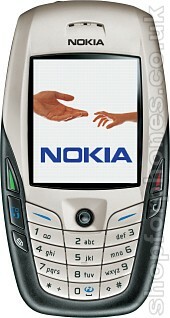 And if you want to first of the second generation of camera phones, then the Nokia 6600 is for you!